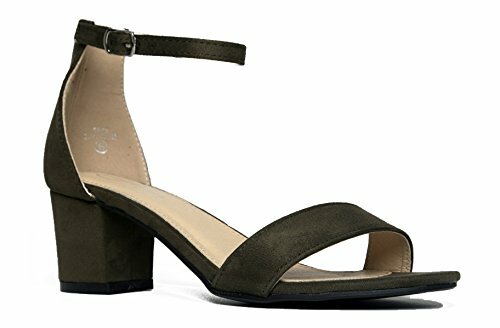 J. Adams Daisy Mid Heel, Olive Suede, 9 B(M) US | What Should I Say? A TIMELESS DESIGN: Classic design that is sure to compliment every modern woman's wardrobe. Update your personal style with a touch of glam with these sensible mary jane pumps by purchasing this pair of heels that will last for all memories! LIGHTWEIGHT AND LIFTED: We love the block heel to give us the perfect boost in height and these are wearable all day long. Ultra lightweight design featuring a buckle enclosure to perfectly hug your feet. STYLISH ANKLE STRAP FOR A SECURE FIT: Featuring a cute strap that hug your ankle for custom support and provides a comfort throughout wear. Your feet will not slip, turn or move out of place while wearing these gorgeous heels! If you have any questions about this product by J. Adams, contact us by completing and submitting the form below. If you are looking for a specif part number, please include it with your message.